Have you been keeping track of your energy usage over the summer? 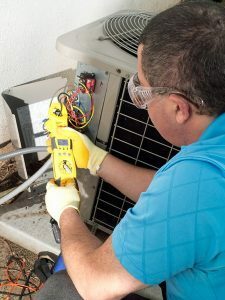 If you’re the type who keeps a close eye on their energy use, then there’s a high chance you’ll be able to catch any serious AC repair issues just by seeing the bill. Even if your air conditioner isn’t making any noticeable symptoms (like those below), a higher than usual cooling bill is a clear indicator that either A) you used the AC way more than you thought or B) there’s something seriously wrong with the AC’s efficiency. If you’ve ruled out the first possibility, then it’s time to call in a technician. Are there odd smells coming out of the air vents? It’s not something you should ignore. A smell like something burning would indicate faulty wiring. We’d recommend turning off the AC immediately and calling a professional. In our Florida humidity, it’s also possible the heat and the humidity can create condensation inside the air ducts. This can lead to the growth of mold and mildew, and that might create a smell. It’s also possible for mold to grow on your evaporator coil. Both cases are examples of what’s called “dirty sock syndrome” by those in the HVAC industry. If your AC sounds like it’s working and if the home does get cool eventually, you might not think to check the airflow coming from the vents. It might not be until the home stops getting cool entirely that you realize it’s time to do some inspections. Clogged Air Filter: A dirty air filter will blow airflow, preventing cooling through the home. Frozen Evaporator Coil: Often a result of a clogged air filter or a refrigerant leak, a frozen evaporator coil will cake the coil in ice, thus blocking airflow. Refrigerant Leak: Your AC depends on the perfect amount of refrigerant to do its job. A refrigerant leak in its late stages can drastically diminish the cooling power. Broken Blower Fan: Cool air is blown through the vents and into your rooms by a fan—unless that fan is broken or obstructed by dust and dirt. Check your air filter, and if that doesn’t fix the problem, call an AC repairman immediately. Airflow issues can be very serious to the health of your AC. Do you suspect your AC has a problem? Contact Bruno Total Home Performance today to speak with a professional!